What can we tangle on, what colours can we use......let's get rid of the box, jump in the deep end and create ? The Diva and Maria are helping us stretch our imaginations and do something different! Love those bins you tangled! And your all colored ZIA is really lovely. 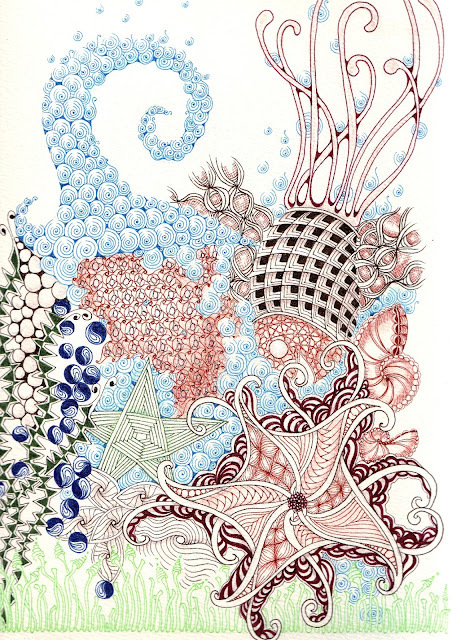 I'm practically drooling over what you've done with fengle in your colored piece, Shelly! Now this is the greatest idea...I usually do not associate beauty and garbage - even if it is recycled - in the same category. You have proven that it can be the case! I adore your ZIA! I love your containers, great idea! Tangles garbage cans! What will you think of next?! I love the printemps "wave" in your ZIA. It's like an underwater scene with bubbles. love, love, love both of these. The colours are great! 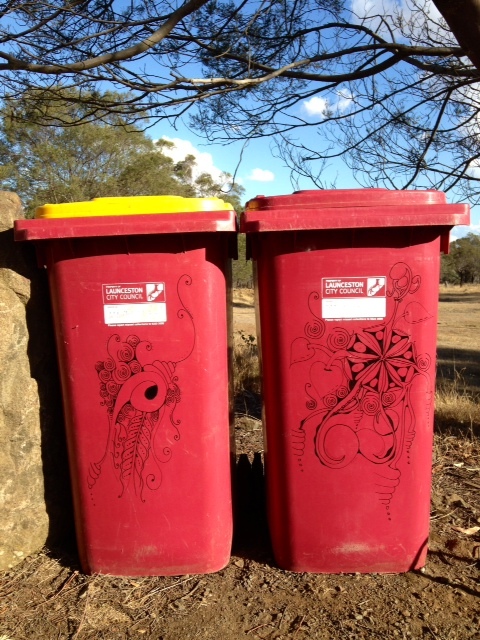 You will always know which bins are yours, Shelly :) Love it! Your bins will put a smile on many peoples faces. They are super fun and your ZIA is awesome. What is there to say after all these comments? So ..... I agree with all. Love, love, love the tangled bins! What a fabulous idea, and you have inspired me to tangle the ugly water barrel by the garage this summer. Thanks for the inspiration! Pretty containers! Love your tile, very organic! My garbage bins lust after yours! How fun. And your ZIA is amazing! HAHAHA! Take THAT, ugly trash bins! I love them!